We have a fiberglass tub, and 7 years ago when we moved into our brand new house with brand new tub, there was a chip or crack in a couple places of the tub, so the builder “fixed” those spots, but really they ended up looking worse, and have seriously yellowed over the years. What should we have done instead of letting him “sand down” the cracks? They were like hairline scratches, rather than deep cracks, but his “repair” actually made it worse. Perhaps your advice will help others before they go the route we did. — L.G. Uh Oh, The Fiberglass Is Scratched! Cracks and scratches in fiberglass tubs are not unusual. We’ve all seen home remodeling shows on TV. With all the dirt, confusion, and transportation in & out of materials, the possibility that something will get dropped, bumped into, or scraped against your shiny new fiberglass bathtub is a real concern. This is made worse by the fact that usually the one-piece tub unit must be installed first — before the drywall, before the flooring, and before all the plumbing fixtures. All it takes is one small slip and you’ve got a gouge requiring some serious fiberglass tub repair. Fortunately, if done properly a fiberglass repair can look as good as new and should provide many years of trouble-free service. Keep in mind that a fiberglass tub isn’t an old piece of lawn furniture that can be fixed with a can of Rustoleum spray paint. For a fiberglass tub repair to last (and blend in properly), you must use materials designed specifically for repairing fiberglass. When fiberglass products are molded, the color of the item is mixed with the gel coat. This means when it comes out of the mold, the final exterior finish was the first layer placed in the mold. No paint is applied. Frankly, paint won’t hold up to the environment that your fiberglass tub will be placed in. Any repair that amounts to sanding down the scratch or gouge, and spraying paint over the damage will not last. It may look presentable for awhile, but chlorine cleansers will fade or discolor the fiberglass repair, and in no time it will look worse than the original damage. A proper fiberglass repair requires the use of a fiberglass tub repair kit containing fillers designed specifically for the task. The key to success is the fact that the acrylic color will be mixed into the filler, not applied on top of the repair. More severe damage that might happen over time — such as cracks that go all the way through the tub or even holes — can all be repaired. Fiberglass is a very versatile product that is much easier to repair than most other building products. Fiberglass mats can also be applied under the bottom of a damaged tub floor to reinforce an area that wasn’t properly supported. Totally refinishing an aged bathtub can return it to like-new condition. Maybe you’re a bit tired of the pink colored tub that’s been in your home for ages. Updating the color with a new gel coat infused with a more current pigment will make your bathtub look like new. So, when that first scratch on your fiberglass tub happens (and just like with a new car, it always does) don’t break out the sledge hammer and start demolition. 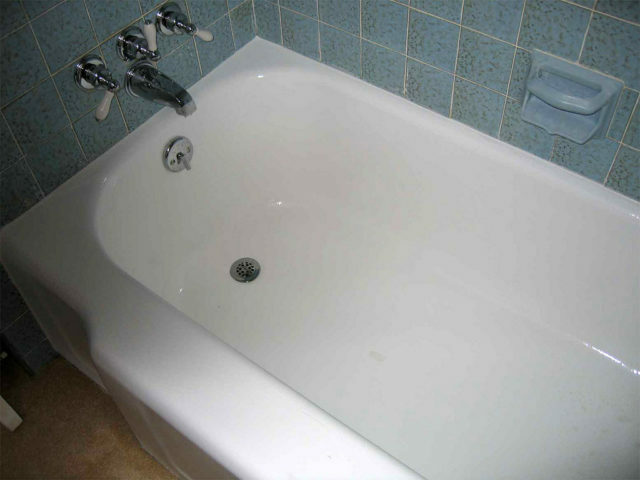 Consider repairing or refinishing your fiberglass tub. It’s a whole lot cheaper than remodeling!